Hokay, where was we, muchachos? 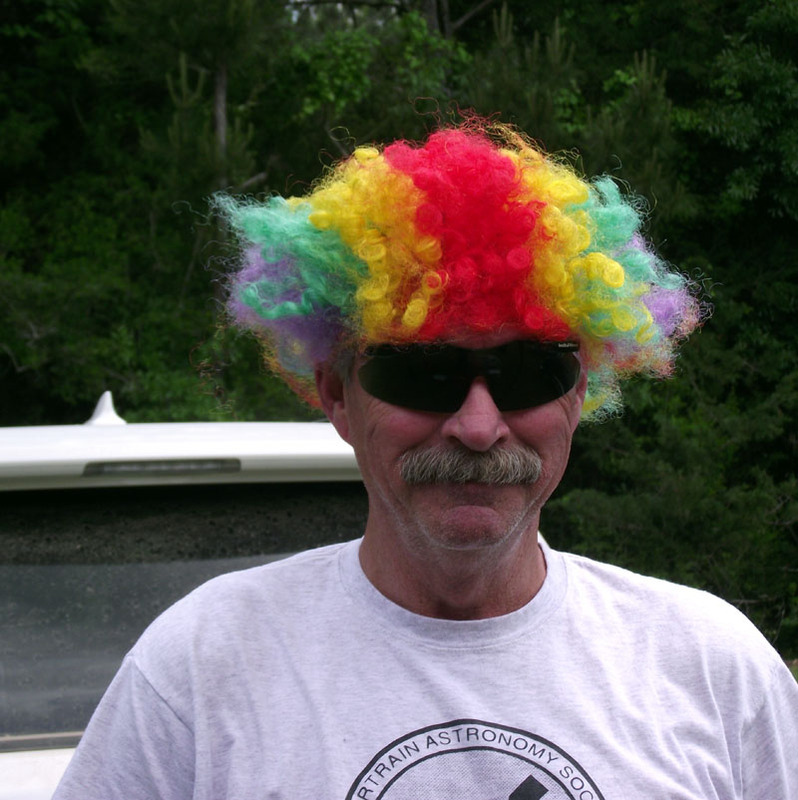 Uncle Rod had just returned from the Deep South Regional Star Gaze Spring Scrimmage. 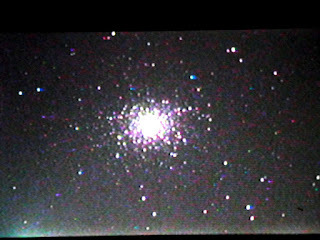 I had bagged a passel of Herchels, well over 100, with my new OTA, Mrs. Emma Peel, a Celestron Edge 800 C8. 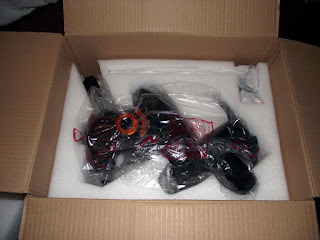 The scope rode on my time honored CG5 for the star party, but awaiting me at home was what might possibly constitute the elusive more better gooder, Celestron’s replacement for the CG5, the VX German equatorial mount. It had arrived on Friday, day two of the star party, and Unk was itching to try it out. 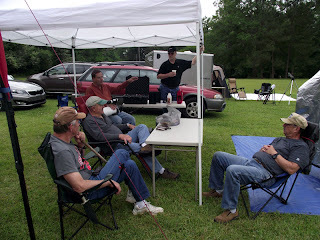 As I told y’all last week, even though I arrived back at The Old Manse by early afternoon, I was tuckered out. I’d been up Sunday morning till after three shooting Herschels, and was back up before seven to pack. Twenty years ago, that was not a problem. Today? Takes me a while to shake off the star party aftereffects. I puttered around, returning most of the gear to its assigned places, took a long, hard look at the big box sitting in the front hall, and decided I’d be better off waiting till the morrow to open it. Comes the dawn, Unk was up bright and early, you betcha, and after a cup or two of java to lubricate the ol’ mental gears, it was time to attack the VX. First order of business was dislodging Growltiger from his wonderful new sitting place, which was the VX’s box. After an entire weekend of enjoying his box, the striped cat was awful put out when I suggested he find another spot. All he did was give me a dirty look. What finally got him going was when Unk pulled out his knife and began cutting the box’s strapping. Growltiger did not like the sight of Unk armed with a knife and decided discretion was the better part of valor. OK, let’s get this thing open. More slicing with Unk’s knife revealed—yet another box. 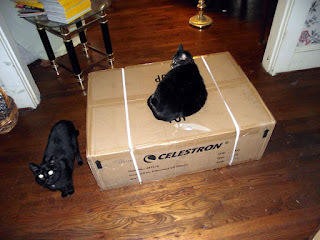 Wisely, Celestron had double-boxed the VX, since the container holds not just the GEM mount head, but an 11-pound counterweight and the whole tripod. Inside, everything was in good shape. Step One would be getting the tripod together so I’d have something to mount the VX on. 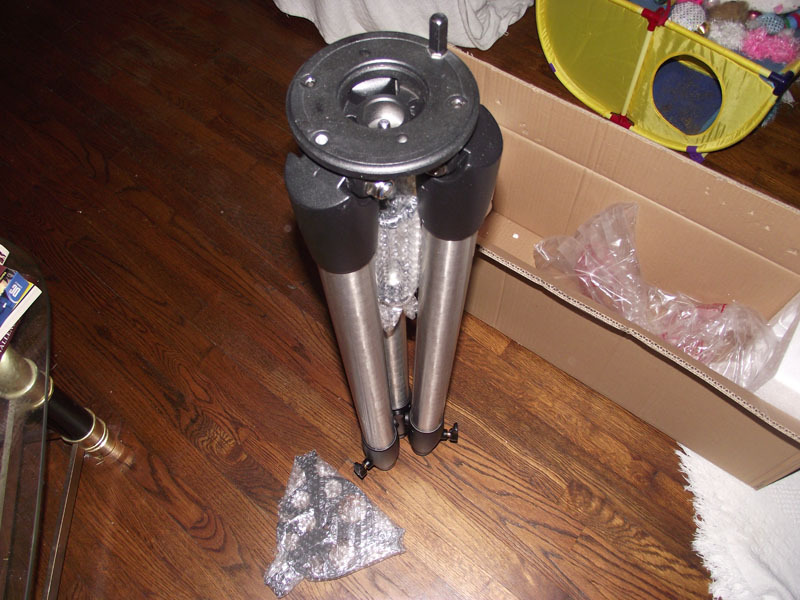 The tripod, in its own slender box, was soon extracted. It was well protected with Styrofoam inserts at either end and the whole shebang was covered with a plastic bag. I did note the Styrofoam at the head end of the tripod had been broken into two pieces thanks to the tender mercies of the Brown Truck Guys, no doubt. 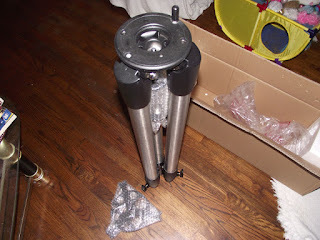 There was no damage, and I soon had the tripod standing on its own in Chaos Manor South’s front parlor. If you own an Atlas or a CG5, this tripod is going to be awful familiar. The VX tripod is identical save for the peg on the tripod head. This peg, which gives the GEM head azimuth adjusters something to push against, has been redesigned and repositioned. It is covered with a layer of plastic, unlike the old bare metal peg, and is located on the outer periphery of the tripod head. The manual now gives instructions for repositioning it “over” a tripod leg instead of “between” two if’n you feel the need. Supposedly, with it between legs, the tripod might be less than stable, but I’ve never had that problem with a C8 payload and left it alone. Otherwise? The tripod spreader/accessory tray is the same. The 2-inch steel legs and the locks for their leg extensions are the same. The tripod tips are the same. The hand control holder is the same (as on the CG5). If you’ve never owned one of Synta’s standard field tripods, all I can say is that this is the best inexpensive tripod I have ever used and is more than adequate for a GEM in the VX—or even Atlas—class. Rubber meets road: get VX head on tripod. The GEM head, sans counterweight bar, was nestled in its own box in a foam cutout, the whole thing protected with a layer of thick foam. With some trepidation, I mounted the head on the tripod, threading the central rod up into the hole on the head’s base. This is where I’d run into trouble with my original VX—the hole was not properly threaded. On this one, it threaded-in easy, same as my CG5 and Atlas and all was well. The only major assembly that remained was installing the declination counterweight bar. As with the CG5, you thread the rod into the dec housing and secure it with the large nut. 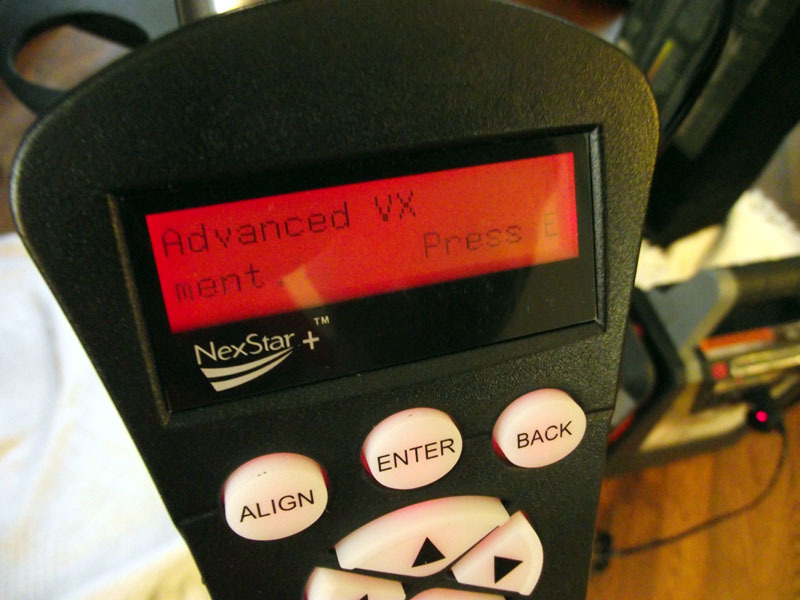 The counterweight bar on the VX is not the same as the one on the CG5. It’s the same diameter (larger than on the Atlas), but it is longer, five inches longer, 14-inches instead of 9-inches. This makes packing more of a pain but balancing easier. A C8 will balance on the VX with a single 11-pound weight with adjustment to spare. On my CG5, it takes two weights. The counterweight itself? Yes, it’s an 11-pounder, but otherwise it is completely different from the standard Synta pancake weights we all know and love. It is of a much more modern shape, has a large easy to manipulate t-handle setscrew knob, and, in a real fillip, Synta has protected the end of that screw/bolt with Nylon so you don’t mar the mount’s counterweight bar. It was now time to examine the hand control, which was well padded in its own package. The HC shipped with this mount is Celestron’s new version, the NexStar Plus, which brings both good and bad. The good is that it has more memory, a faster processor, and a higher resolution display. The “bad” in the opinion of this old boy (and Thomas Aquinas, “Tommy,” Chaos Manor South’s resident black cat, who didn’t seem impressed) is that the buttons have been rearranged and relabeled to make them more “user friendly.” Famous last words, those. Not only do we now, confusingly for old-timers, have “Back” instead of “Undo,” the wonderful “M” and “NGC” buttons are gone. Now, you have to wade through a menu to get to Messiers and NGCs. A Celestron symbol key has been added that supposedly functions like a “shift” or “Ctrl” key, but I’m not sure what it is good for at this time—if anything. Finally, I noted the hand control cord is ridiculously short. Contrary to what you may have heard on the dadblamed Cloudy Nights BBS, though, it’s only an inch or so shorter than the (still too short) cable of the original model. All this is really of little consequence to me, since I will likely operate the mount with NexRemote almost all the time, just like I do the CG5. HC plugged in, that left only two things in the big box, the manual and the accessories. I did refer to the manual during assembly, but VX assembly is purty much identical to that of a CG5, so a quick look or two was sufficient. I’ve never seen a good manual from any telescope maker, but the VX manual is an improvement, at least. If nothing else, it now includes the instructions for doing an AllStar polar alignment the CG5 book lacked. Since NexRemote is now distributed freely on Celestron’s website, there was no NR DVD in the package. There was one containing the basic “First Light” edition of TheSky X. How is that program? I like it a lot; in fact it has replaced Stellarium as the “quick what’s up look” program at Chaos Manor South. Actually, I probably like it better than I would the Professional edition of TheSky X. I’m not likely switch from SkyTools and Deep Sky Planner for serious work, after all. That left the accessory box, which was in one piece, but had taken a bit of a beating from the counterweight container, I suppose. Inside was an HC holder for the tripod, a computer interface cable (first time I’ve found one in the box with a Celestron-branded mount or scope), the declination cable, and a 12vdc power cord. The HC holder is the same as the CG5’s. It snaps onto a tripod leg and does a good job. There’s a hole in the bottom to pass a serial cable through to connect to the HC. Nice, and always has been. The coiled declination motor cable is similar to the one for the CG5. I’d like to have seen the dec connection routed internally, but at least the VX’s cord is shorter and less likely to snag on sumpin. 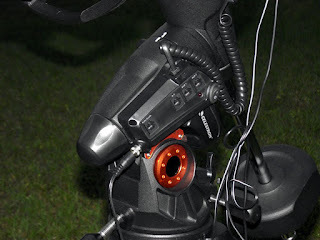 Have to have a way to power the mount, of course, and the method Celestron provides for the stock VX is a 12-volt DC cable with a cigarette lighter plug on the end. The 12vdc cord is, like all other Celestron 12vdc cords, excessively long. I suppose they think you will plug into your vehicle’s ciggie lighter. I urge you not to do that at a dark site unless you want to be stranded. The CG5 was purty dadgum power hungry, anyway. At least the cable is of heavier gauge wire than the CG5 power cord. One other change is that there is now a threaded collar à la the CGEM on the scope-end plug. That’s it unless you choose to buy options. I have no use for a GPS receiver since I mostly use NexRemote and NexGPS, so I didn’t pony up for that. I did buy an AC power supply. I like to run on mains current down Chiefland way. The supply for the VX (and CGEM, I believe) is a nice one that looks like a laptop power brick rather than one of the old-timey wall warts. According to its label, it can furnish the VX with five amps of juice, which is more than enough. New mount assembled, the next thing I always do is a “fake” alignment inside the house to make sure everything works more-or-less like it should. Before we do that, howsomeever, let’s take a closer look at the VX’s GEM head. As you-all can see, this is not a gussied up CG5; it’s been redesigned. The RA housing is much more modern looking, considerably better finished, and appears stronger. The plastic RA motor cover is more attractive, much smaller, and less likely to snag a cable. Same goes for the declination motor, which, unlike the one on the CG5, does not rotate with the declination axis, a big help in reducing the chance of snagging cables or rubbing on another part of the mount. 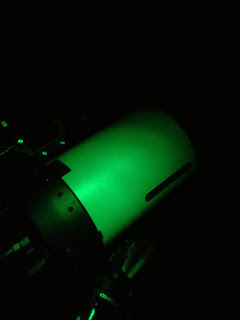 A small but important improvement is that the RA and declination index markers are a million times easier to see in the dark than the pitiful labels on the older mount. I never had much trouble with the altitude and azimuth adjusters on the CG5, but they did have small and hard to grasp knobs or were just bolts with minimalist handles. The VX is mucho different, troops. Big knobs for the azimuth adjusters and the rear elevation bolt, and a large T-handle for the forward elevation (locking) bolt. 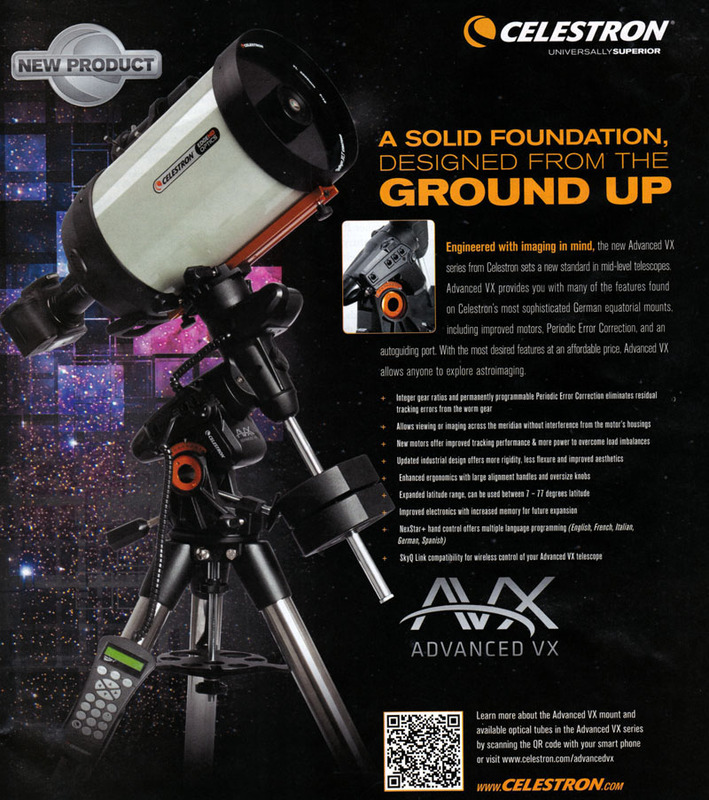 The design of the VX allows you to tilt the head down for latitudes well below 30-degrees, a problem with the CG5. Bigger knobs are also a feature of the bolts that hold the OTA in the mount’s saddle. The CG5 had one bolt and one safety screw. 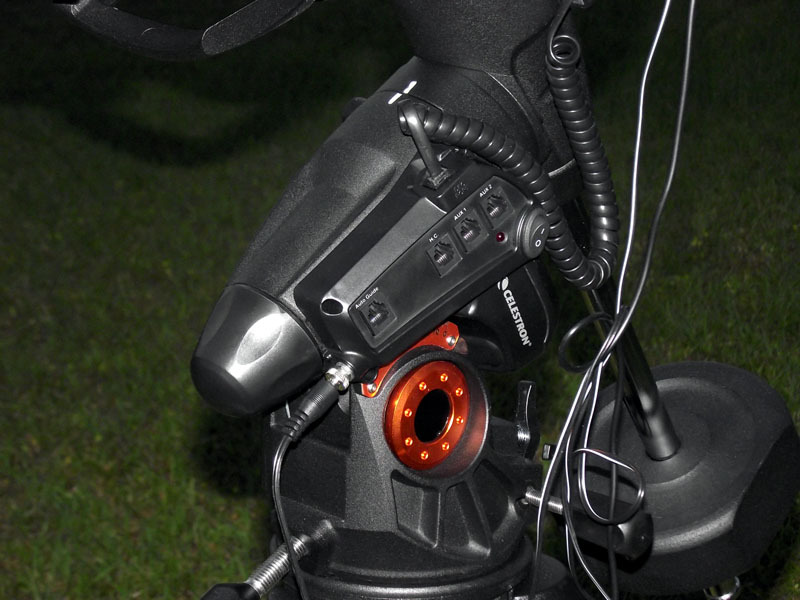 The VX has two bolts with large knobs, larger than those on the Atlas EQ-6. 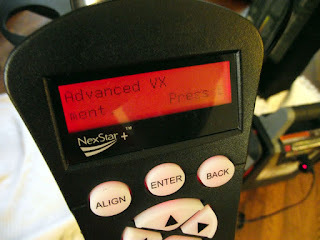 The VX control panel has also been completely redesigned. It is now horizontal, protruding from the RA housing east side, rather than vertical and on the motor housing as with the CG5. The declination port has been moved from the control panel per se, and is on the right side of the control panel housing facing up. There is now less chance of the dec cable interfering with anything and much less chance of plugging the declination into the wrong port as Unk has been known to do. The connections on the panel are, from left to right, “Auto Guide,” “HC,” “Aux 1,” and “Aux 2.” There’s a large but not offensively bright red LED pilot light, and, wonder of wonders, an adult-sized power switch that looks like it, unlike the CG5’s tiny, pathetic one, might last a while. The VX’s RA/Dec assembly, like that of any German equatorial, has to ride on a base that allows it to be tilted up and down and turned side-to-side for polar alignment, and the one on the VX is not only more modern looking than the CG5’s, it is obviously sturdier. I don’t have much use for a latitude scale, but the orange anodized one on this mount shore is purty. It’s easy to read, too, with a black scale and numbers that stand out well against the orange. The elevation axle is luverly: it is, like the latitude scale, finished in orange anodizing. Minor details? Guess what the CG5 has that the VX does not? Setting circles. It’s not like anybody ever used ‘em. Oh, and that “falls off if you look at it sideways” cover for the rear of the RA housing? It’s been replaced with a nice molded screw-on job. Finally, the forward cover for the polar bore now has a Celestron symbol molded into it. Big Milestone One time: fake alignment. Tommy and I plugged the power cord into the mount. The thread-on collar is nice, but we also took the precaution of gently spreading the pin halves on the mount-side power connector a wee bit with a jeweler’s screwdriver—ain’t never seen a Celestron other than the NS11 that didn’t need that—and powered her up. After a short pause while the HC computer thought about this or that, the backlight came on, and from there it was a two star alignment as per normal. Well, almost. The higher resolution display on the HC has smaller characters that are hard for my late middle-aged eyes to read. Apparently, you can adjust the font size, but I ain’t tried that. I entered time, date, and location like always. Only potential difference there is that, like the CGEM, the VX has an onboard Real Time Clock that, if turned on, will keep date/time updated. Unk shall probably leave it off since I will mostly use NexRemote, which uses the PC’s date and time. I told Miss HC to begin a 2-star alignment, and things proceeded as they always do. I just pressed “Enter” and “Align” when the mount stopped. I said she could forget Calibration stars, and told her to go-to “M002.” Yes, it was annoying to have to drill down one menu level to the Messiers, but she went right to the general area where TheSky X said M2 ort ta be. Success. I know the question you little rascals are itching to ask: “Unk, how loud are the motors compared to them screaming Mimis on the CG5?” You can hear for yourself. I filmed a video of the fake go-to and put it on my cotton-picking Facebook page, but suffice to say they are noticeably quieter than the notoriously loud CG5 motors, if maybe not as quiet as the Atlas EQ-6’s steppers (like the CG5, the VX uses servo motors). 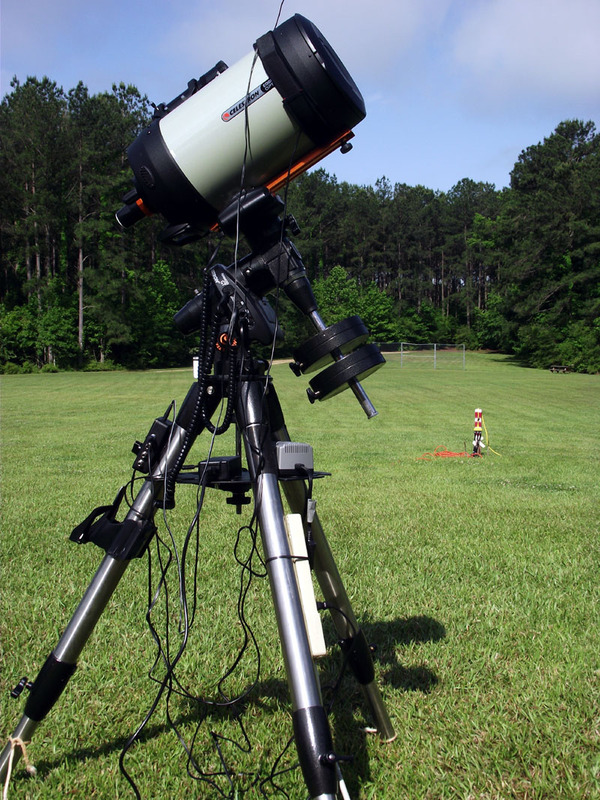 The only true test of any piece of astronomy gear is in its natural habitat, an observing field under the stars. 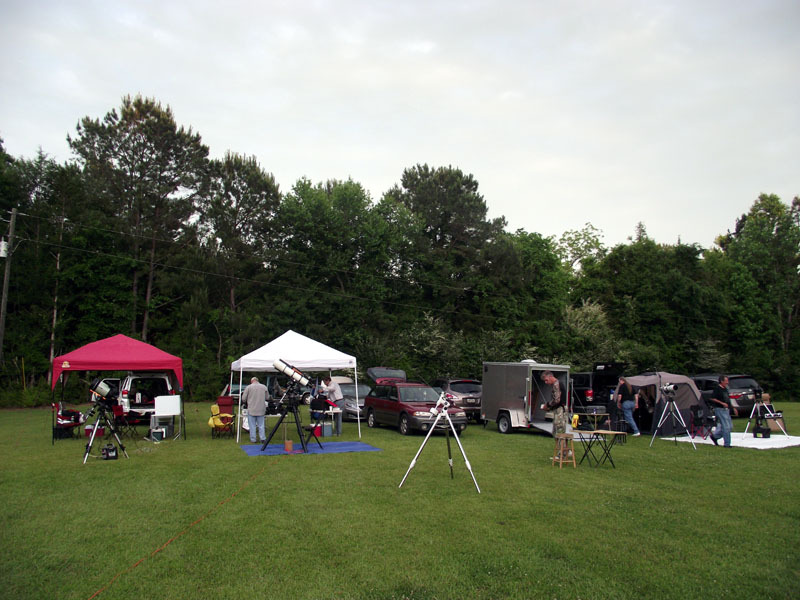 I planned to do that this past Saturday night at the Possum Swamp Astronomical Society dark site. Maybe. The weather forecasts had looked iffy for a day or two, and on Saturday morning, when Miss D. and I were off to Mobicon, The Swamp’s yearly comic book/SF/anime/gaming convention, they were sounding worse. Whatev. Lot of hours till darkness, and we would see what we would see. Amazingly, at 6 p.m. the sky did not look that bad. 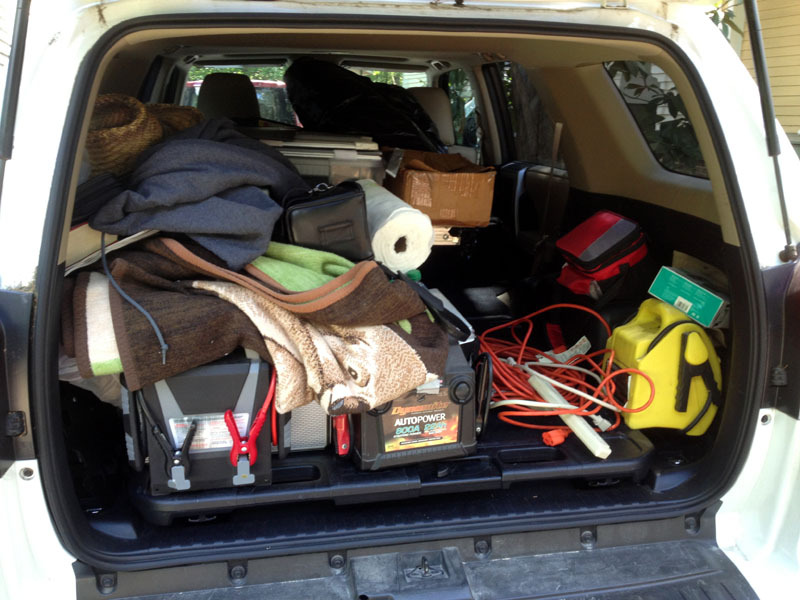 Unk loaded up the 4Runner, but only minimally so: mount head, tripod, Edge 800 OTA, accessory box, utility box, eyepiece case, cupla jump-start batteries. 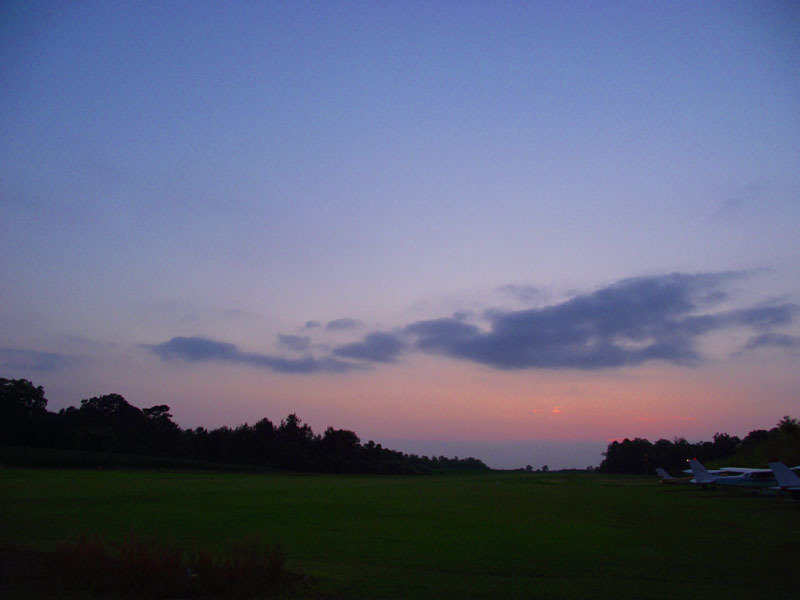 The hour’s drive to the PSAS dark site was not unpleasant—when I didn’t look at the sky, that is. The farther west I got, the more clouds I saw. Still, when I arrived on the field at seven it didn’t look awful. A beautiful crescent Moon was riding high, so I would be all by my lonesome this evening, but that was OK. 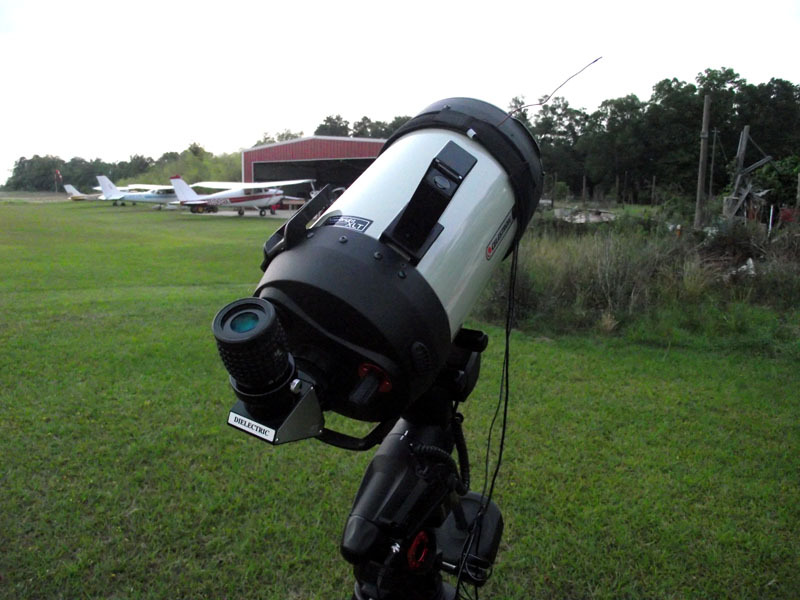 Given the conditions, my only goal was to align the scope and do a few go-tos to verify its proper operation. One sweet thing about buying an update to the C8 and an update to the CG5? It didn’t take me any longer than normal to get the mount and OTA ready to go. Just a few minutes and it was time to get my new finder aligned. As I mentioned to y’all last time, the design of the Edge 800’s finder mount makes it prone to misalignment when you remove finder and ring mount from the tube for storage. I don’t much like 50mm finders anyhow. I sure don’t need one on a go-to rig; it is much easier to hit alignment stars with a zero-power (unit power) finder like a Telrad. Now, I love the Telrad, you-all, but I must admit it does look a mite big and clunky and I didn’t think one would look too classy on my beautiful Edge C8, Mrs. Emma Peel. She deserved something more elegant, I thought. But something as functional as the Telrad. That, I decided, was the Rigel Quickfinder. An “upright” style, red-reticle rig. It’s smaller than the Telrad, and the base looks OK secured to the tube with double-sided tape. I ordered my Quickfinder from one of my fave astro-merchants, Agena Astro Products, who got it to me in time for the Saturday tests. Pointed the scope at the windsock at the far end of the airfield runway and soon had the Quickfinder aligned with my 16mm Zhumell and, after that, with the 12mm Meade reticle eyepiece I use for alignments. I noticed almost immediately that the mount was easy to work with unpowered. The C8 stayed where I pointed it much better than it did with the kinda springy CG5. Finder aligned, I looked up, and was not exactly thrilled with what I was seeing. More clouds. Darker, thicker clouds. I had intended to do a normal alignment, but I wasn’t sure the sky was gonna last that long—it wasn’t yet dark enough to see alignment stars. How about a Solar System Alignment, then? 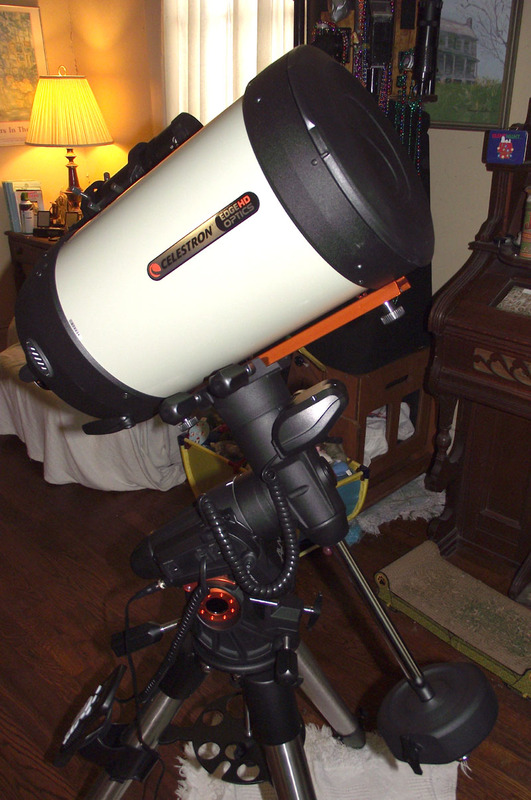 I fired up the mount, selected “Solar System Alignment,” specified “Moon,” and the mount was off for Luna. She stopped surprisingly close to our satellite—the VX was not even roughly polar aligned, just pointed more or less north with my compass. I centered Diana up and hit align. Before doing anything else, I wanted a good look at the pretty crescent. In my el cheapo 16mm Zhumell 100-degree AFOV eyepiece, she was beautiful. Dead sharp almost to the very edge of the field. As I said last time, the Edge optics almost make the sow’s ear Zhumell into a silk purse Ethos. But not quite. I removed the Zhumell, inserted the 13mm Ethos (154x), and dern near had my socks blown off. The terminator was tack-sharp from one field edge to the other. I sent the mount to Jupiter, and while the planet was close, it wasn’t in the eyepiece. Which was what I expected. I really needed to do a Two-star to assure myself about how well the mount would work. Looking north, I saw Polaris was in the clear, so I lined up the hollow polar bore of the VX on the star while waiting for a little more clearing. Those big altitude and azimuth adjusters were indeed a joy to use. So, I waited and I waited. Just as I was about to give up hope, there was a sudden semi-clearing at astronomical twilight. I judged there might be just enough stars visible to do a real alignment. I cycled the mount’s power, returned it to the index marks, selected “Two-star” and away we went. The first star, Capella, was close but not in the finder reticle’s middle circle when the slew stopped. I centered her up, and the mount headed for star two, Procyon. Very interesting. This time the star was in the center circle of the finder. It was not in the eyepiece field (45-degree apparent field at 166x). But dang close. Next were Calibration stars. I did all four because I could, but I sure didn’t have to. Cal Star 2, Mizar (I’d had to reject Spica, which was cloud-covered), was in the eyepiece field when the mount stopped. So were stars 3, and 4. The CG5 has never done this well. Not at f/10, anyway, for god’s sake. The night was steadily growing worse, with my new iPhone app, Scope Nights, now saying the remainder of it would be “poor.” One more trip to the Moon, which was smack in the center of the 13mm, and I was ready to shut down—and not just because clouds were now pouring in from the southwest. “What was the problem, Unk? Come on, now…did you get spooked again?” Maybe I felt a little nervous on the dark field as the clouds began to close in and make the night blacker than the inside of Thomas Aquinas, but it wasn’t the Mothman, the Little Grey Dudes from Zeta Reticuli II, and the Skunk Ape that got me loading the gear in a hurry. It was the little monsters. The skeeters. I thought I had a can of Deep Woods Off in the utility box, but I did not and I was simply being eaten alive. I was quite happy to be rolling back to Chaos Manor South with Miss Van Pelt’s air-conditioner blasting. The bugs are back and so is the humid Possum Swamp heat. Summer is here well ahead of Memorial Day. Back in the den, watching the pea-picking Ghost Adventures and enjoying a dose of Unk’s favorite beverage, I was a happy and relieved little camper, muchchos. 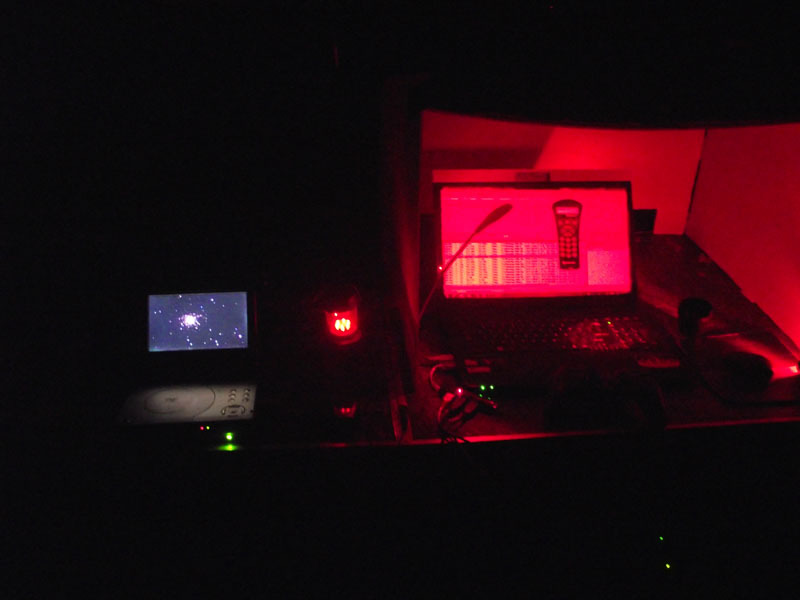 Yes, go-to as implemented by Celestron is pretty foolproof (ahem) these days. But you never do know. I told a buddy I’d be happy if the VX worked as well as the time-proven CG5. 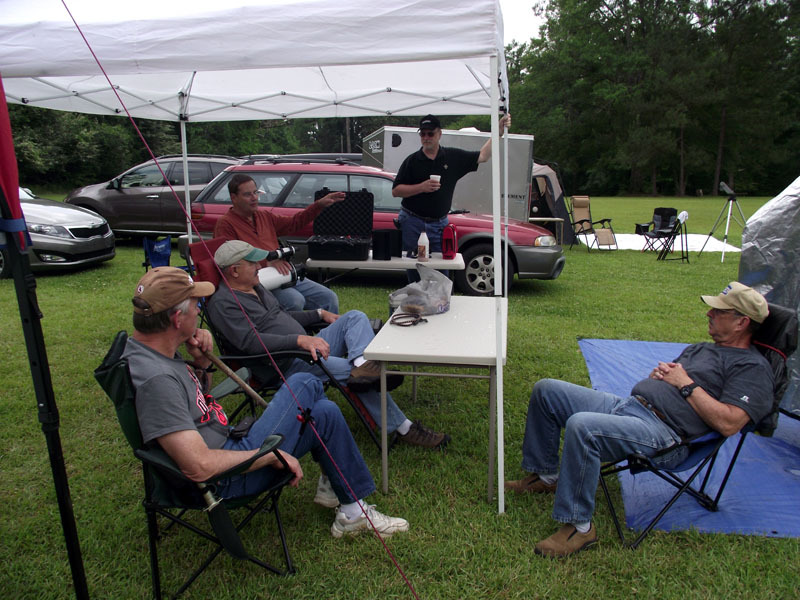 The verdict after Saturday night is “better than the CG5.” Maybe considerably better. I think this is the beginning of a beautiful friendship. 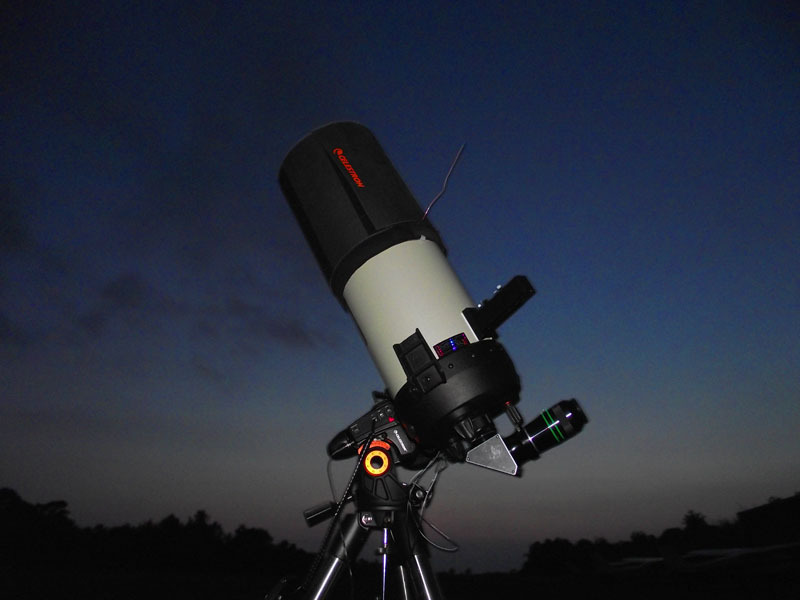 I have a Chiefland trip planned in a month or two, and I should know even more about the new scope and mount combo after that. Y’all stay tuned. 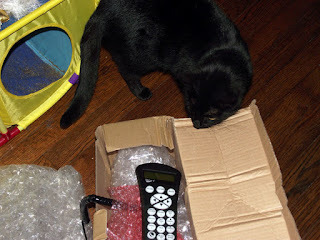 In addition to the video, you can see many more pictures of the VX unboxing on Unk’s Facebook Page. One of the many things that are great about being retired from my daytime engineering job, muchachos? 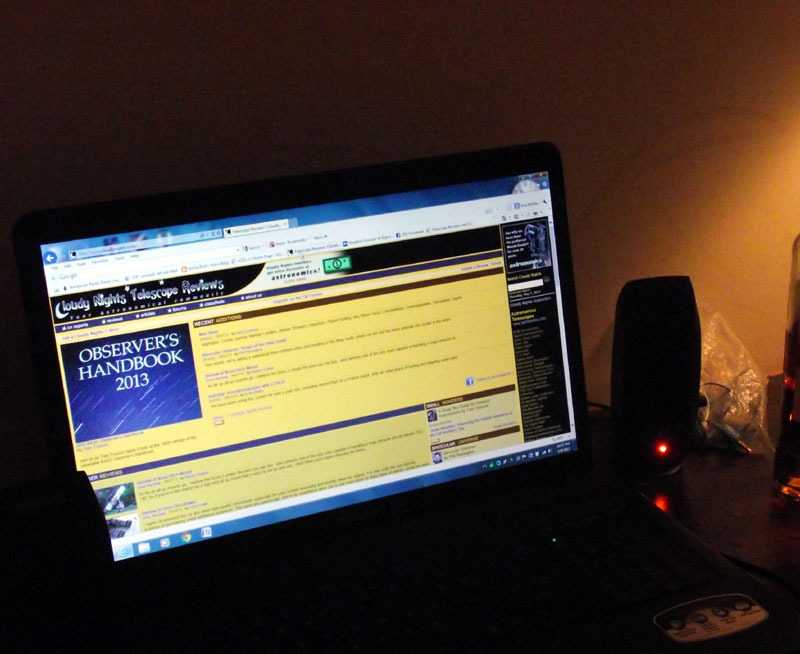 It allows more time for what really matters: practicing, writing about, and talking about amateur astronomy. 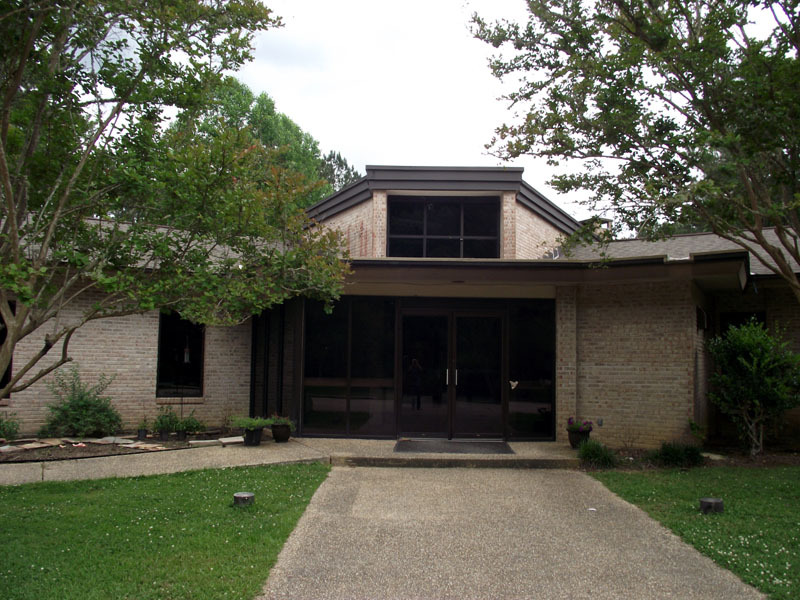 When Phyllis Lang, author of Deep Sky Planner and an officer of the Raleigh Astronomy Club of Raleigh, North Carolina, enquired as to whether I’d be available to give a presentation for them, I was happy to reply that I dern sure would be. Which presentation would that be? 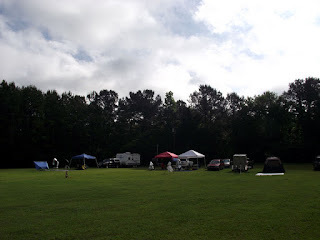 My Herschel show, “In the Footsteps of William and Caroline.” That’s my current one, and turned out to be what the folks up yonder in Raleigh wanted to hear, anyway. I am at work on a new talk about video astronomy, and the Mallincam in particular, but I likely won’t have that ready till time for this year’s Almost Heaven Star Party in September, where I plan to debut it. Anyhoo, deciding to do a gig is easy. Getting there is tougher. I don’t have to tell y’all about the state of the U.S. air travel system. Combine the TSA with the money-hungry deregulated airlines and you do not have a recipe for pleasant air travel. Pretty fur piece from the 70s when Unk was regularly flying the Pan Am Champagne Clipper to the West Coast. Two things made the trip to North Carolina bearable. First was Phyllis getting me on the second flight to Atlanta Friday morning instead of the way-too-early first one. Even better was my realization that all I had to do was get to Raleigh in time to give my presentation and make it back to The Swamp “sometime.” In the past, I’ve always been stressed-out juggling the demands of that engineering job (YOU WANT A DAY OFF? HELL, ROD, YOU JUST HAD ONE LAST YEAR!”) with what I really wanted to be doing. Now there’s no need to beg for a day off. No business calls during my trip. No crises to worry about. That was enough to make traveling to Raleigh almost fun. Almost. When you are flying out of Possum Swamp and headed for the East Coast, there are two realities of Airline travel: you will stop in Atlanta (a little old lady of my acquaintance says that when you die and are on your way to the Great Beyond, you still have to stop in Atlanta), and you will fly Delta. Last time I’d been on one of their aircraft, last year, I was somewhat impressed. This time, following their recent merger with Northwest? Good and bad. At least the Friday flight out was on a full-sized jet instead of a puddle jumper, but Delta’s boarding system ticks me off. I understand them boarding First Class first. You ought to get a few perks for them extra bucks. But instead of boarding the rest of the plane after that, Delta has an endless variety of classes they board next: “Business Elite,” “Gold, Silver, and Diamond Medallion,” “Skymiles Cardholders” and on and on and on. It’s terribly inefficient and time-consuming. At least they didn’t try to charge me five bucks for a bag of peanuts like one U.S. airline did last year. Sure makes me long for British Airways. Another gold star for Ms. Phyllis: she got me aisle seats all the way and arranged my flights so I had plenty of time between planes in Atlanta. That can be a problem, since my connection is usually at the extreme other end of that giant airport. Wonder of wonders, not this time. We were wheels-down in “A” and my Raleigh flight was in “B.” Sat at the gate and read the book I’d brought with me, Stephen King’s Black House, for somewhat less than an hour before it was boarding time and I was off on the last leg. 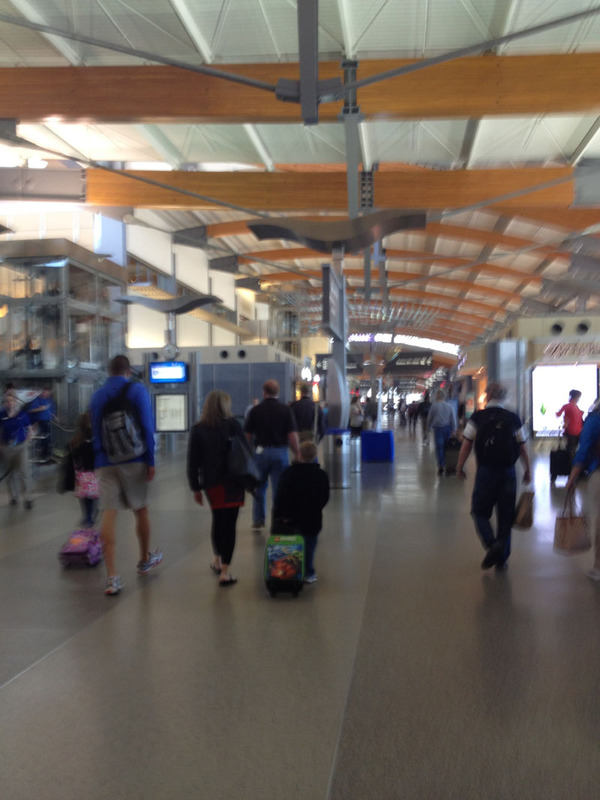 My impressions walking into the Raleigh – Durham airport? “Nice. 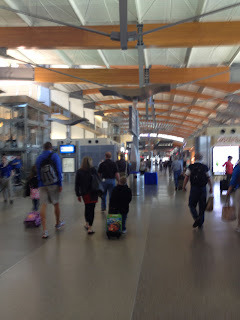 Sure a lot bigger than Possum Swamp’s pitiful aerodrome.” While Raleigh and The Swamp are comparable in population, Raleigh is the state capital and has much more industry, including high-tech industry, than we do, so it’s not surprising their airport is a couple of clicks (at least) up from ours. Next step was retrieving my checked bag. Since the Atlanta flight out of The Swamp is usually a small jet that requires you do a planeside baggage check, I don’t do a carryon. No point to it. I have my laptop (this time my Asus netbook) with me on the plane and that is it. I found baggage claim and my suitcase without too much wandering around. Didn’t see anyone who looked like they might be Ms. Phyllis, so I rang her cell phone. Turned out we were in sight of each other and didn’t know it. Shortly, Phyllis and hubby Mark were delivering me to the airport Embassy Suites, where, after just a little confusion on the part of a desk clerk who was a good example of the Peter Principle (“Oh, you had a RESERVATION? I DON’T SEE ONE FOR YOU. WHAT WAS YOUR NAME AGAIN?”), I had a room in which to relax for a few hours. This Embassy Suites appeared to be an older member of the chain, a lot like the one Miss D. and I stayed in in Nashville for ALCON 2003, and that was fine. Nice big bed, LG TV in the bedroom, little sitting room with another LG and a couch. I thought I’d check my email, connected to the wi-fi, and immediately got a demand for $$$. Seems the Embassy Suites fancies themselves a hotel, and believes that means they can and should charge for Internet. Not this little black duck. Since I’d only be in the room briefly, I said “NUH-UH, YOU SUCKAS,” and proceeded to check my mail with the iPhone. Good thing I did, since there was a missive from astronomy-dealer extraordinaire Bob Black of Skies Unlimited. He was letting me know my NEW TELESCOPE would be on its way to Chaos Manor South shortly. New telescope? Yep. A new C8. “Dagnabbit! A new C8, Unk? How many cotton-picking C8s do you have already?” Three. The C8 is my favorite telescope of all time. I’ve never loved a scope like I’ve loved the C8, but why did I need yet anudder one? There was actually some logic behind my acquiring another C8—as much logic as Unk ever displays, anyhow. It was really more about a mount than a telescope. 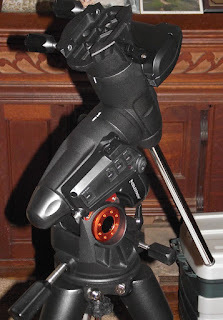 As y’all know, one of my most-used telescope mounts has been the humble Celestron CG5 go-to GEM. It’s done more than its share of the work of the Herschel Project. I’ve put a lot of miles on the mount in the eight years I’ve had it. Not that it doesn’t work as well as it ever did—it does—but when Celestron recently came out with an improved CG5, the VX, I thought it might be a good time to relegate the high-mileage CG5 to backup status. 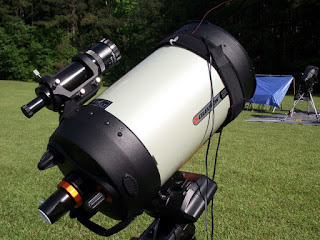 A while back, I’d been thinking idly about the Celestron Edge OTAs. Mighty purty with their white/blue-gray tubes. And that beauty is not just skin deep. An onboard corrector in the baffle tube reduces both coma and field curvature. Would I want one? From the first look I had through a Meade RCX in ’06, I knew there was something to this “improved SCT” bidness. Using my buddy Mike Harvey’s LX200 ACF just reinforced that. The views through the eyepiece were simply better. And… The Meades only correct for coma, not field curvature. 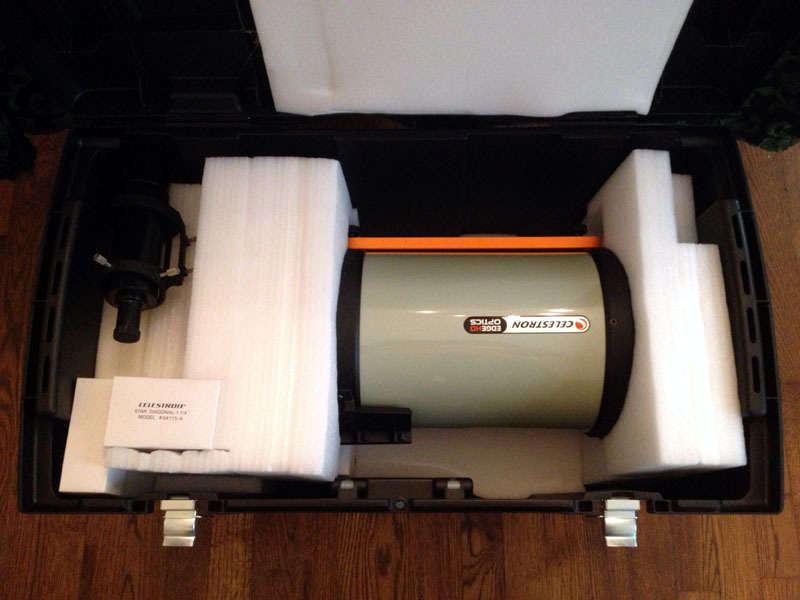 The Celestron Edge ought to be even more better gooder. I decided that if time came to buy a new SCT OTA I’d be foolish not to get an Edge. As I was ruminating on the above, I happened to open the then-current Sky and Telescope. What was staring me in the face in a full-page ad? A beautiful Edge 800 C8 on a VX mount. Well, I did need to replace that mount, and shouldn’t pore ol’ Unk get a retirement gift of some kind? Shortly, Mr. Bob had my credit card number. By the time you read this, there should be a new SCT at Chaos Manor South and you will hear a lot about it over the coming months, I’m sure. I was excited my new scope was on her way to me, but I was also tuckered. I turned on the TV, collapsed on the couch, set the alarm on my iPhone for 4:00 p.m., and proceeded to doze the rest of the afternoon away, visions of Edge HDs dancing in my head as CNN droned on unheeded. Seemed as Unk had barely closed his peepers when the iPhone began emitting the full volume klaxon that is the only thing that will wake him up on occasions like this. Dressed, it was time to prepare for the big show. Netbook operational? Check. PowerPoint file still working? Check. Backup copy on my flash drive still there? Check. Black cowboy hat on head? Check. I was out the door. My hosts knew I needed a little supper before going on, and spirited me off to a nearby pub, “Tripps.” It was a local chain in the Ruby Tuesday’s/Applebee’s/TGI Friday’s mold, but a cut above those in quality, Unk thought. What caught my eye in the menu was the prime rib sandwich. That and a couple of Kolorado Kool Aids, but only a couple, and I was ready to go on. Rarin’ to go on in fact. I’ve done my little shows (“presentation” doesn’t really describe Unk’s usual shenanigans) at some good venues over the years. Portland’s Kendall Planetarium comes to mind. The North Carolina Museum of Natural Sciences took the cake and the prize, though, y’all. Big theatre with a powerful LCD projector at the back, excellent P.A. system—I prefer to work with a mic whenever possible—and, most of all, expert assistance from the RAC’s AV person. What a treat it was to see my PowerPoints giant size. Getting my computer slides ready was as easy as it’s ever been, so I had a little time to wander the museum’s exhibit area. Since Raleigh is home to the Research Triangle and The University of North Carolina at Chapel Hill is nearby, I was not surprised they had a high-quality science museum, but it was still a surprisingly wonderful place. I hope the residents appreciate it and their kids love it. Then it was showtime. 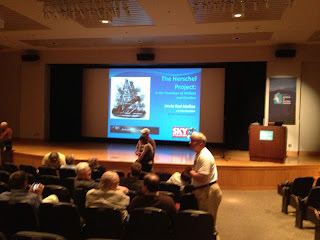 Starting with Unk’s usual corny jokes and other foolishness: “Before we get started, I want a show of hands; how many of y’all have ever owned a Lynyrd Skynyrd Album?” From there, I was on to the story of the Herschels and the Herschel Project for somewhat over an hour. 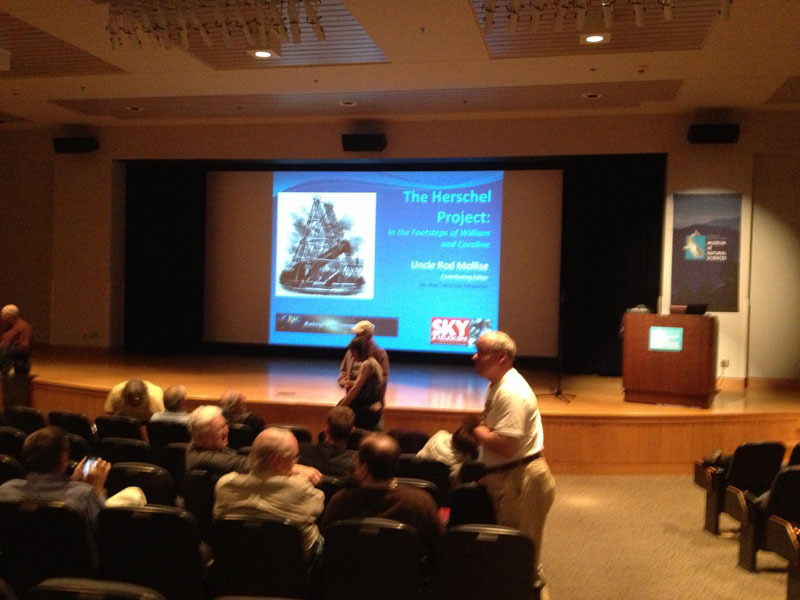 The audience was responsive, and there was a good turnout considering the somewhat esoteric subject, observing all 2500 Herschel objects. Another twenty minutes or so of questions, and it was back to Tripps. 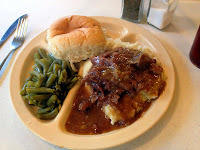 This excellent club always repairs to a local restaurant for their “meeting after the meeting.” Phyllis asked me whether I was up for another visit to Tripps. I said I was dang sure not hungry after the prime rib sammich, but that if drinks might be involved I would dang sure be happy to attend. She assured me they would be, and I spent a couple of hours having fun and drinking draft Blue Moons (the perfect beer for astronomers, natch). 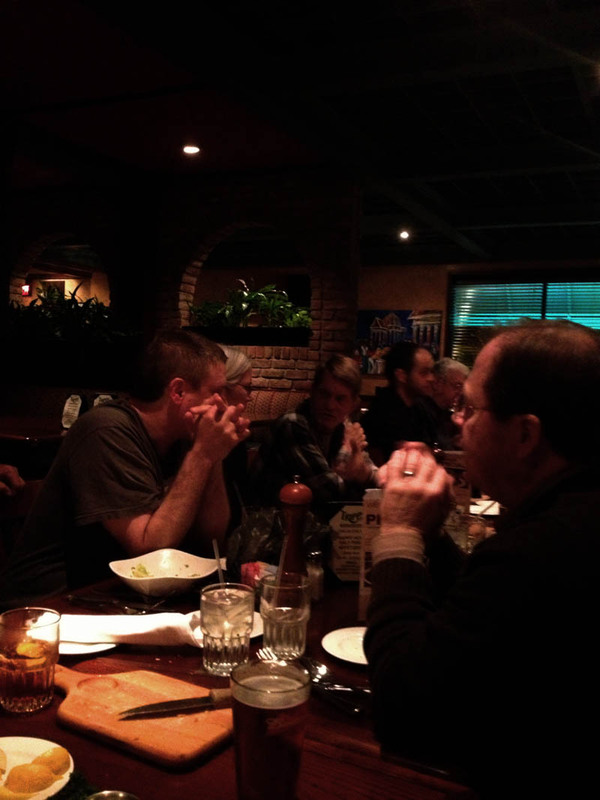 I talked everything from the cost of a good eyepiece to the minutiae of the Sherlock Holmes stories and had a Real Good Time with the big RAC group. One thing I took note of? 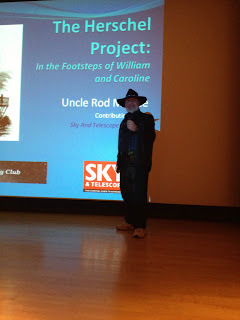 Many of the questions I was asked during the Q&A after the talk and at the restaurant had to do with video astronomy. Naturally, I talk about deep sky video cameras in “In the Footsteps of William and Caroline,” since the Mallincam and the Stellacam were such a big part of The Project. Even those folks who obviously didn’t care pea-turkey about tackling the H2500 were eager to hear about video. Seems to me it is catching on in a big way and is spreading way beyond the borders of the Billy Dodd Field at the Chiefland Astronomy Village. And so it went for quite some time. I beat my turns-into-a-pumpkin time of midnight, but just barely—maybe. Leaving Tripps, I glanced at my watch. I believe it read “11:30,” and I had not set it to Eastern Time. Oh, well, I’d had a splendid evening with a big bunch of friends, and my nap earlier stood me in good stead. Still, as soon as my head hit the Embassy Suite’s pillow, I was off to night-night land with barely a glance at American Pickers, which I’d dialed up on the fracking cable TV. At nine the next morning, Phyllis and Mark picked me up and delivered me back to the airport. My flight wouldn’t board till 10:30, but I like to have plenty of time to clear security and find my gate. On Saturday morning, the airport wasn’t busy and I more or less breezed through and was soon back to reading Black House and waiting to board for the return to The Swamp. The trip home was uneventful, with the only real tiresome part being the last, the flight from Atlanta to The Swamp. Unlike Friday, I was on a puddle-jumper jet, the ride was rough, and the cabin was hot. That was OK, though. Almost there. When I finally walked through the portals of The Old Manse, I was surprised at how rested I felt. Not having to face the start of a workweek at the dadgum shipyard did indeed make a big difference. I was famished, though. I’d had nothing since a modest breakfast at the Embassy Suites. I’d planned to fill up on junk at the Atlanta Airport, Popeye’s chicken or Checkers burgers, but had had to go without lunch. The concourse where my gate was was being remodeled, and the only restaurant other than sit-at-the-table-and-a-waitress-comes bars and grills was a freaking Quiznos. No thanks. Since I didn’t feel tired, I eschewed my usual after-splashdown supper of Chef Boyardee and hustled Miss D. off to Buffalo Wild Wings, where I ordered a dozen boneless wings (wild) and gobbled every one of them suckers right up. Back home, I still wasn’t ready to call it a night. There was that DVD. Before I’d got out of the Langs’ van, Phyllis had handed me a disk containing version 6 of her famous astronomy program, Deep Sky Planner. 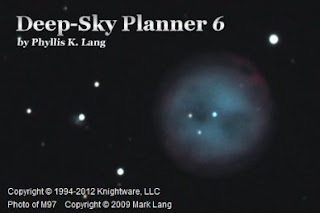 Deep Sky Planner 5 was one of two programs, along with SkyTools 3, that got me through The Herschel Project. Frankly, without those two softs I’m guessing I still wouldn’t be done. As y’all know if you read my blog entry on DSP or my review of Version 5 in Astronomy Technology Today, I liked Phyllis’ program a lot. You also know what a nit-picking old fuddy-duddy I can be, and there were two things I did not like about the program. Most irritatingly, when you wanted to download Digitized Sky Survey images of list objects, you had to do them one at a time. That’s OK for a 50 DSO list, but 2500 fuzzies? No way. I also found the import utility lacking, and wished for a way to easily convert ascii files of deep sky objects to observing plans. Would those two minuses be turned into pluses in 6? I wanted to find out. One thing I was happy to learn about DSP 6 once I had it installed and running? It don’t look much different from 5. It was obvious I wouldn’t have to learn the program from scratch. I was also pleased it loaded my DSP 5 observing plans without complaint or need for conversion. How about that import routine? Would it be any better? To find out, I exported a SkyTools 3 list, “Best of the Herschel 2500,” as a text file. Opened the import widget, told it the file name to import, what to call the output file, where to put it, and mashed the “go” button. In just a few seconds, I had a DSP 6 plan. Every one of the objects had been squirted into DSP format. It was so easy, I couldn’t resist converting a longer list of 250 “H2500 Objects Left to Image” to DSP format. Again, the import facility worked flawlessly. OK, I was willing to concede DSP’s import utility was now world-class. How about the dadgum image retrieval? With just a little fumbling and bumbling (What? Me read a help file?) I found a button that would download images for all the “left to image” list’s DSOs at once. No fuss, no muss. In just a few minutes, pictures for all 250 Herschels were saved and ready for use. Not only did the image retrieval work, it worked fast. What else? I am sure there is much other New Good Stuff in DSP 6, but other than the above, what impressed me was that the program’s performance seems better. Maybe it’s just me, but everything seemed a little zippier in 6. One of the big draws of the new version according to Ms. Lang is that she has put a lot of work into improving the accuracy of the program’s catalogs. Which is good to hear. To some extent, planner programs live or die by the accuracy of the data in their huge databases. ‘Course what really matters is how a program does on a dark observing field, and DSP will get its chance Real Soon Now. 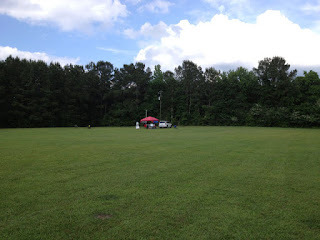 I’ve decided that it will be “DSP 6 only” at the upcoming Deep South Regional Star Gaze Spring Scrimmage, which kicks off shortly. Yep, Unk will be using a new planning program, a new telescope, and a new mount for the star party. Is he brave or just crazy? Time will tell muchachos, time will tell.